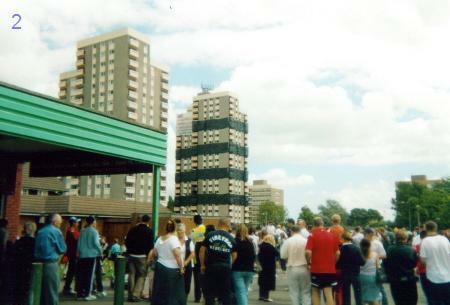 The Homethorpe cluster of tower blocks on Hull’s Orchard Park Estate, a few seconds before noon on Sunday 14th July, 2002. From left to right are Bridgeman House, Vernon House, and Drake House. Drake, at 167ft (51m), is the smallest unit. It is bound with what looks like giant black tape. A siren sounds and, on the dot of the hour, a muffled explosion is heard. 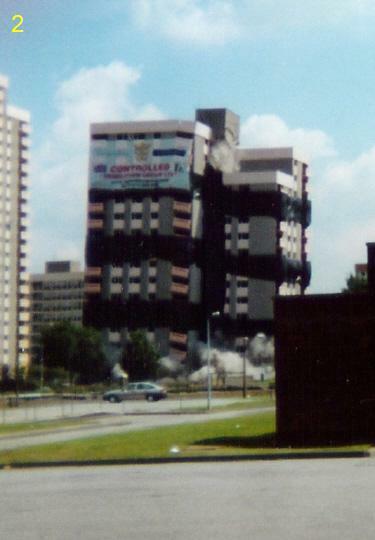 Immediately, the building crumbles at its base. 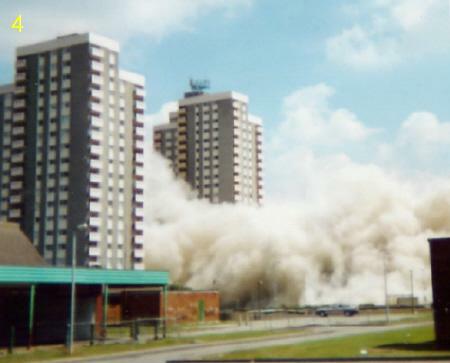 Faster than this amateur snapper was prepared for, the 17-floor structure is reduced to a cloud of dust. 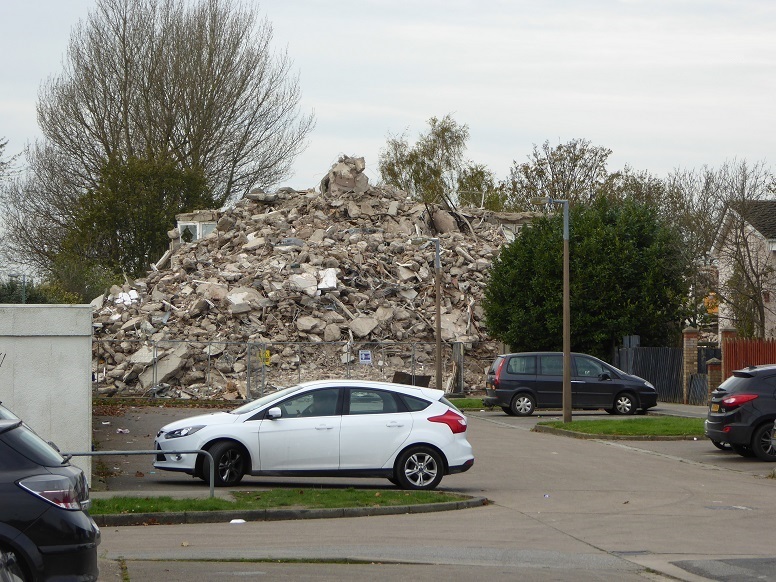 The billow rises up the side of the adjacent blocks but, remarkably quickly, even the dust surge is gone – though the car parked in the middle ground probably needed a wash! 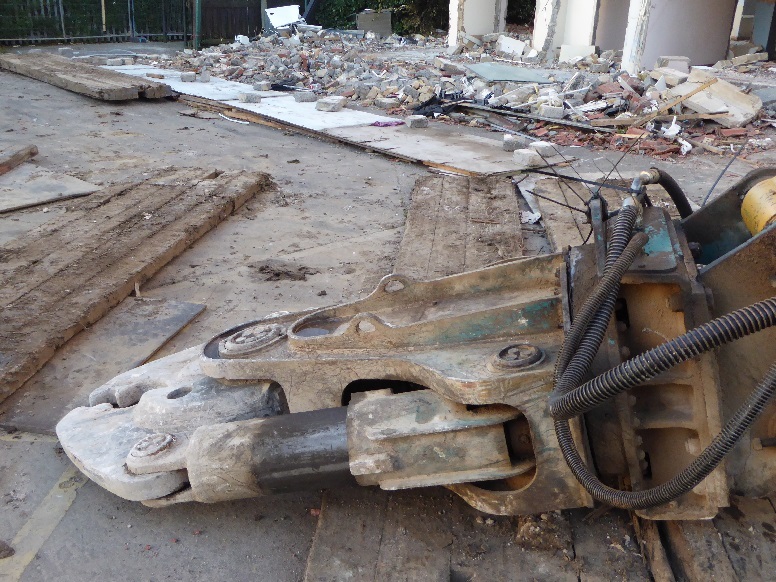 As Drake House tumbled, two blocks of the estate’s Milldane cluster were also demolished. 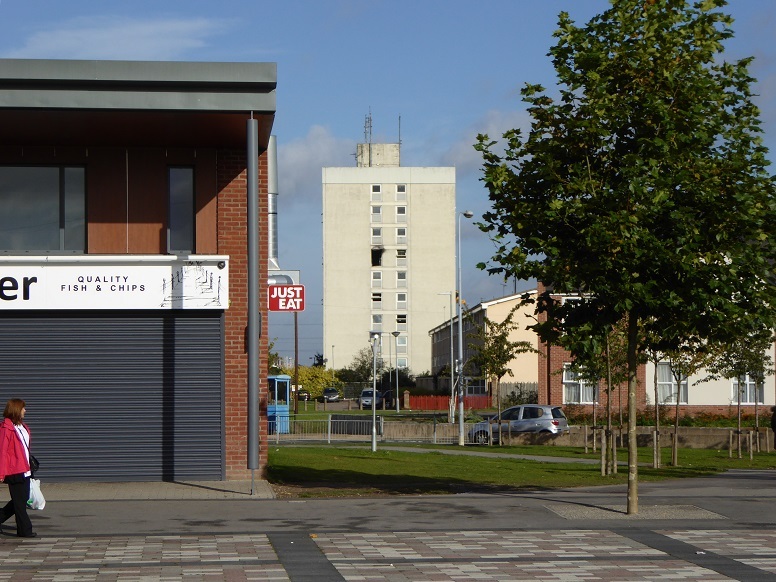 These received the main focus of local and media attention, not least because a popular public house nestled in the shadow of one of the units. The pub escaped with hardly a scratch. Drake House appeared generally liked by its residents. Conveniently placed for shops and public transport, the building was in good condition and about halfway through its practical life. At the invitation of a group formed to challenge the proposal to demolish, some students at the city’s School of Architecture drew up innovative plans to reconfigure Drake’s floor layouts for improved accommodation and mixed use. However, this was a time when the Hull City Council was under increasing pressure from Central Government to reduce its social housing stock. A citizens’ jury was set up to debate the issue of demolition (mainly of Drake House), but the decision had already been made. At noon that July day, a lot of addresses were removed forever. 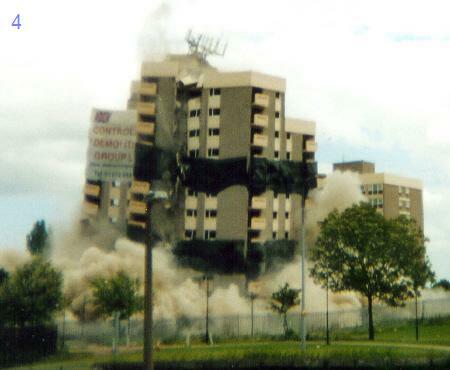 Vernon House was originally to be demolished together with Drake House and the two Milldane blocks in 2002. As residents were being rehoused, and with D-Day approaching, it was realised that no arrangements had been made for resiting the complex of communications antennae that covered the roof of the building and which provided lease income. 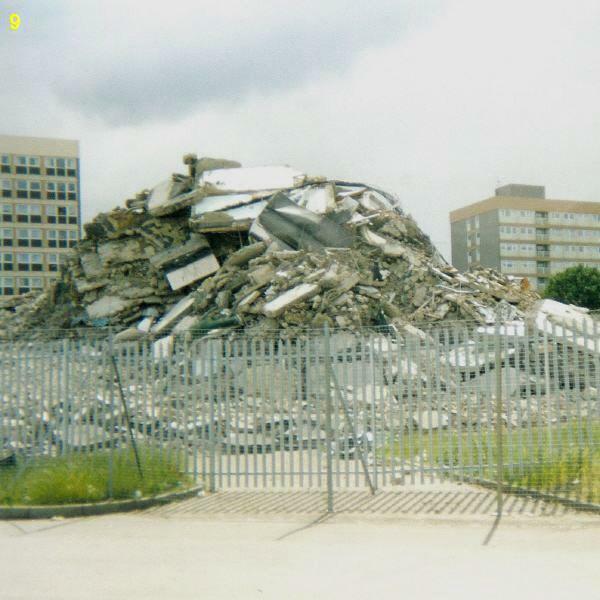 This expensive oversight brought a stay of execution for Vernon, demolition taking place on Sunday 27th June, 2004. 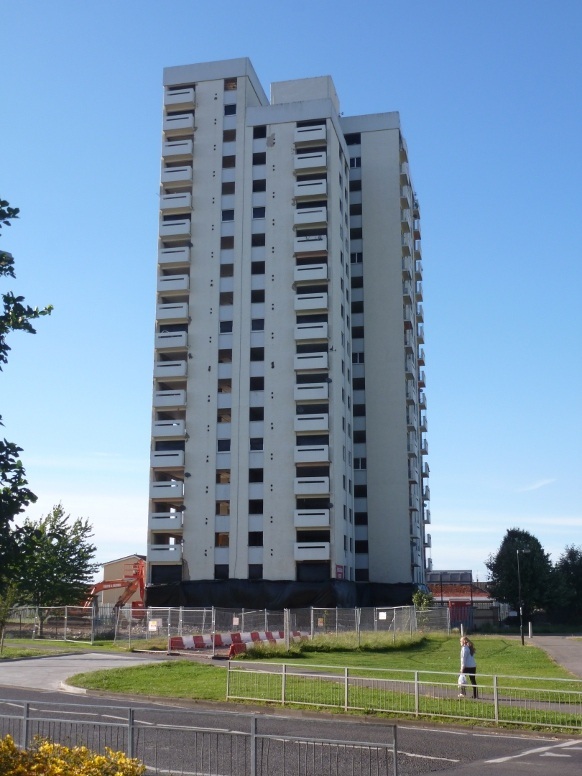 Completed in the late 1960s, the Homethorpe blocks were given names of naval admirals from history (Bridgeman, Drake, Vernon) during a refurbishment programme around the early 1990s. Also, controlled entry and a 24-hour concierge service were introduced. Vernon acquired a concentration of tenants, many of them young, who were barely or inadequately prepared for accepting social responsibilities. 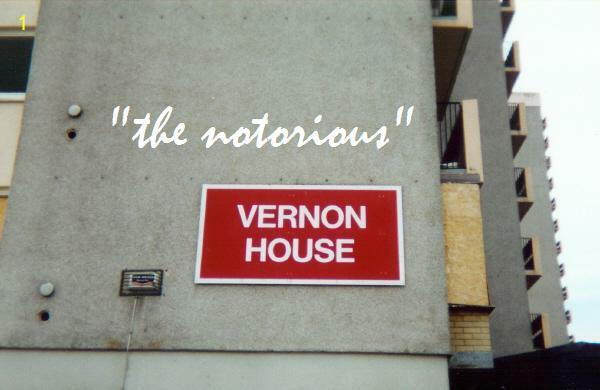 The Council’s housing allocations policy must be regarded as a factor, but the reputation of Vernon House was perhaps sealed by the local media’s regular and unhelpful attachment of the adjective ‘notorious’ to the name whenever an incident was reported. There was only the one attraction that day. 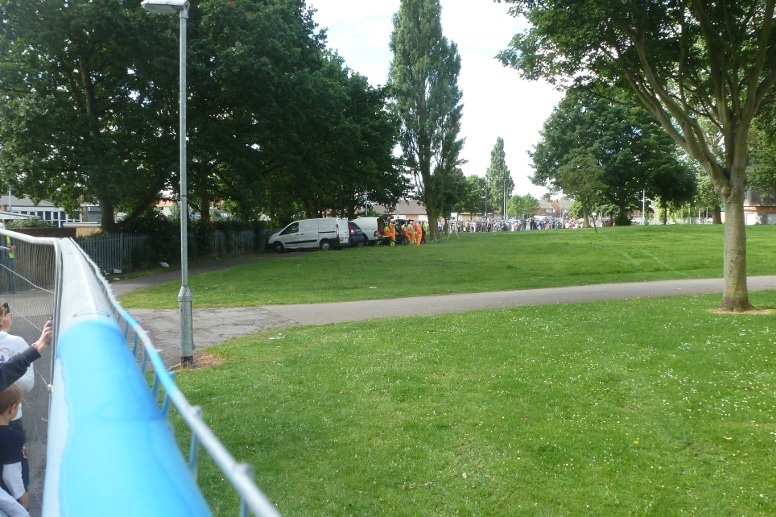 A pupil from the nearby primary school pushed the plunger. His action detonated some 1200 charges to release 30 kilos of carefully placed explosive, reducing the 210ft (64m) high 22-storey tower block – the joint tallest residential building in the city – to a 15,000 tonnes pile of rubble deposited within its own curtilage [Pictures 3 to 8]. 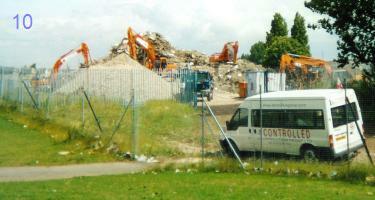 Diggers were soon picking away at the heap. 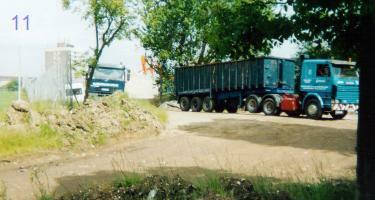 Concrete debris was crushed to a manageable size and removed by lorries using a temporary access from Hall Road. 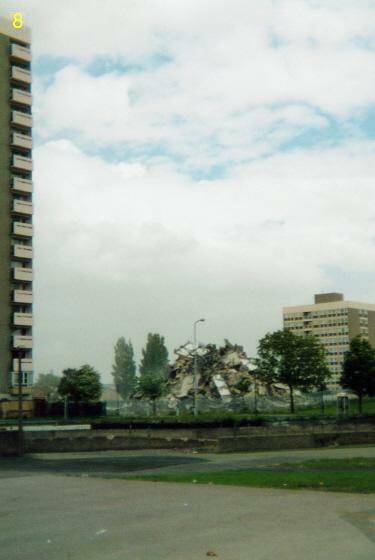 Above, the rubble of Vernon House lies behind a former entrance, overlooked by Kinthorpe (left) and Laxthorpe (right) low-rise blocks. An attempt was made to retain a mememto of the felled edifice - a name board. Unfortunately, only the right half of one board survived preparations for demolition. It spelled ‘NON USE’, and was discarded. A descriptive memory of Vernon House lives on, however, as the model for Hopewell House in Iain Brimswall’s novel The Zoo Keeper. 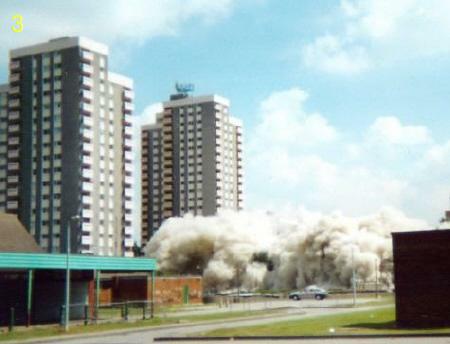 When major regeneration of Orchard Park was announced in July 2009, the plan was to remove all the multi-storey dwellings in the area before construction of new homes began. 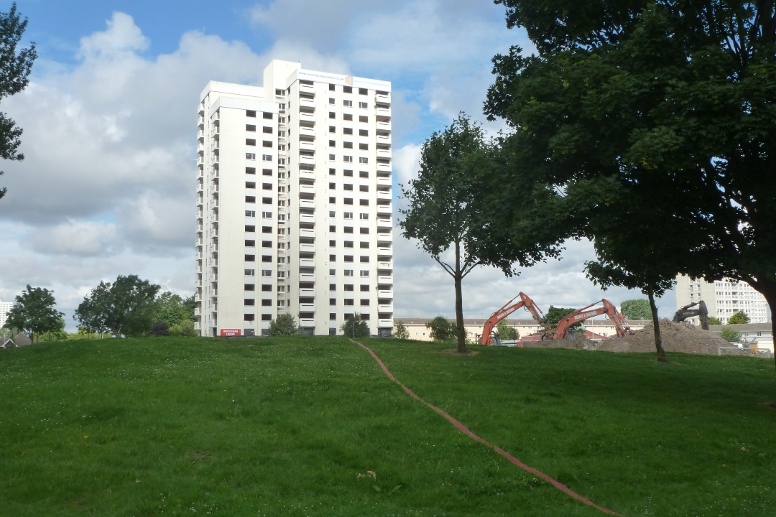 The sudden cancellation of the project by the Coalition Government in November 2010, and a change of political majority within the Council the following May, gave rise to a period of uncertainty regarding the future of the estate’s remaining tower and low-rise blocks. 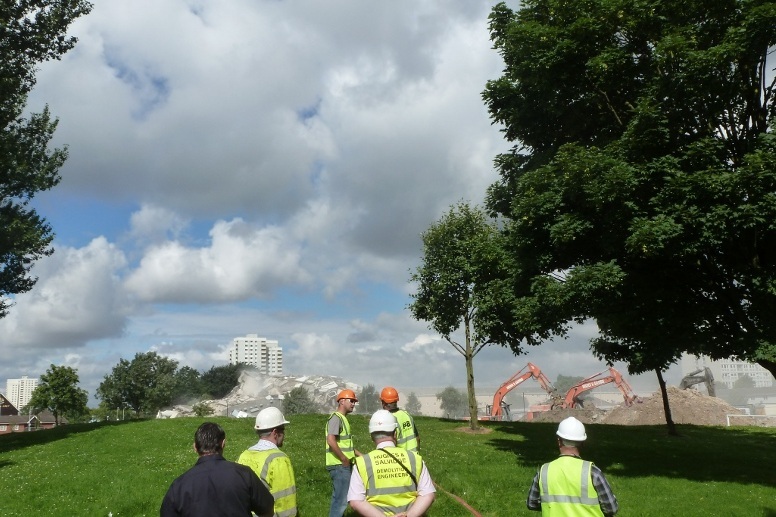 The fate of Bridgeman House, though, was never in question – an extra care facility had been planned for construction on and around the site of the former Homethorpe cluster. 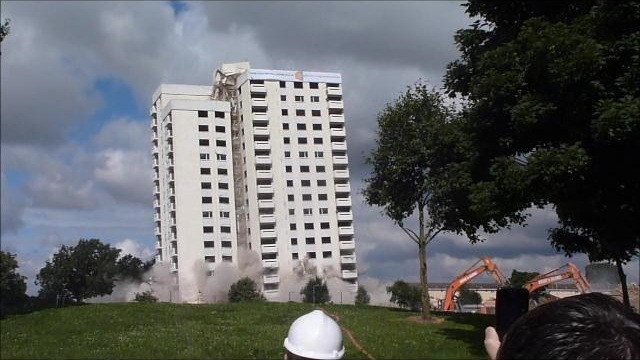 The trio’s longest surviving high-rise unit was brought down by controlled explosion minutes after ten o’clock on the morning of Sunday 29th July 2012. Picture taken on the evening of Friday 27th July 2012. A single retaining band this time, placed around the base. Sunday morning, and minutes away from the big bang. The official observers are in place. A job well done. In the distance, the Ashthorpe and – at extreme left of picture – Highcourt high-rise blocks await demolition at a later date. Part of the roof survived the fall. The short wall at the end of the path once flanked the main entrance to Bridgeman House. 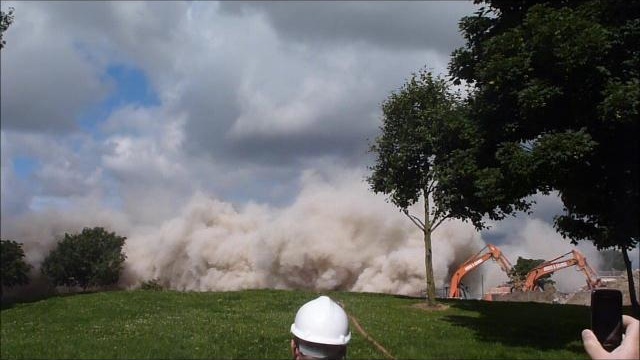 Glimpsed behind the mass of debris is the Gorthorpe low-rise block. 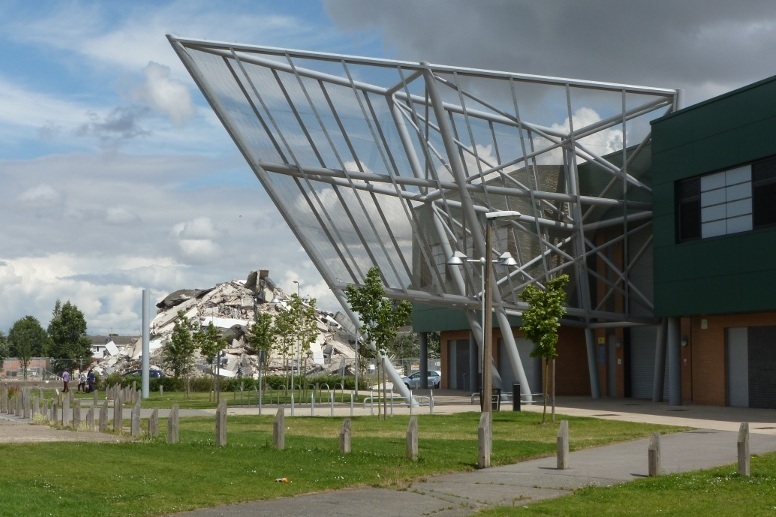 The ‘ship’s bow’ metalwork added to the front of the Orchard Centre, an integrated services centre opened late 2009, perhaps shares a complementary geometry with the rubbled remains of the last of three tower blocks which dominated the local landscape since the 1960s. 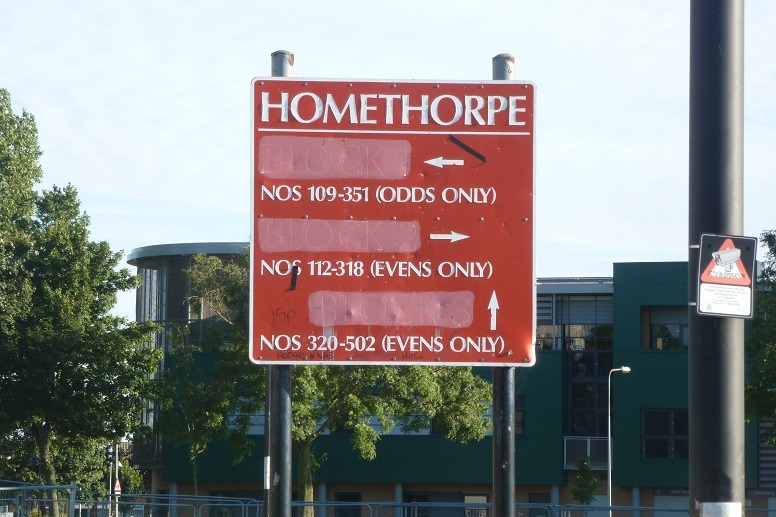 Once the rubble of the last demolition had been cleared, all that remained as explicit evident of the Homethorpe high-rise community was a solitary signboard. Painted over are the block numbers, used before the flats were given names. The sign was taken down during the second week of April 2013 and is now in private ownership. 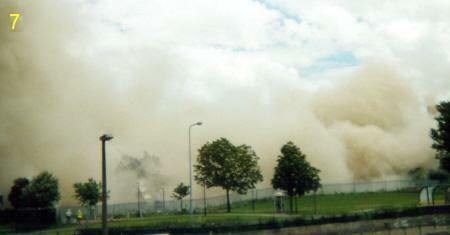 In the background is the Orchard Centre. 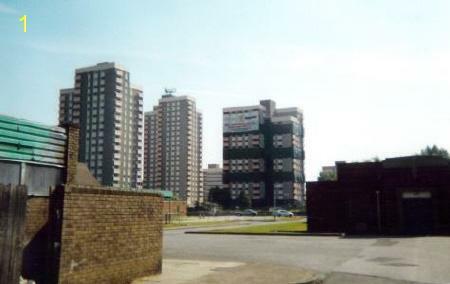 To the east of the Homethorpe cluster of three high-rise blocks were two smaller structures, the first multi-storey units to be built on the estate. These 10-storey low-rise, or ‘midi’, blocks were situated at the end of Kinthorpe and Laxthorpe cul-de-sacs, and addresses were numbered accordingly, though the main entrances to the otherwise unnamed buildings faced towards Homethorpe. Both provided accommodation for residents above a certain age. 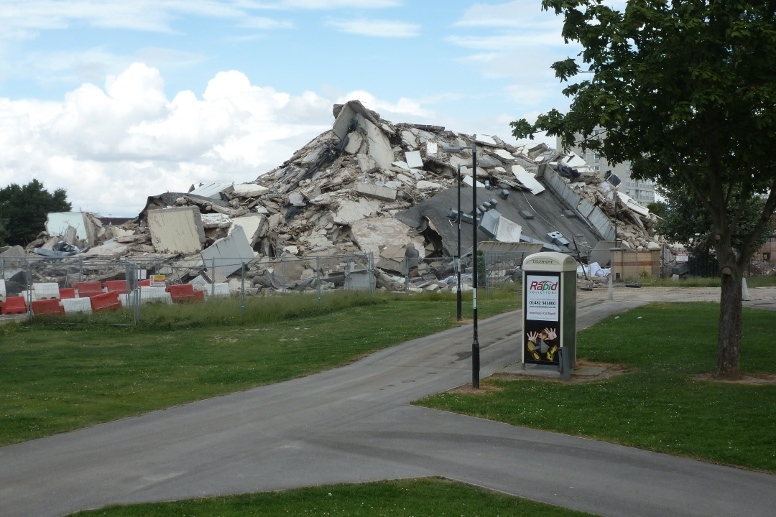 As late as 2013 the plan was to retain the Kinthorpe block along with the low-rise at Gorthorpe while only the Laxthorpe unit would be demolished. When changes to proposed sources of funding made refurbishment to a modern standard unfeasible, total removal became the only course. 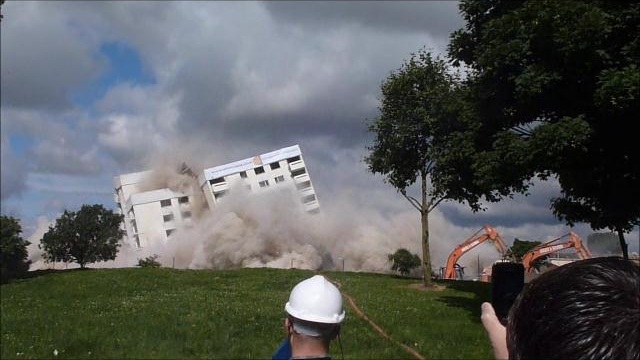 Unlike the former neighbouring high-rise blocks, the two smaller units were mechanically dismanted using a ‘nibbler’. 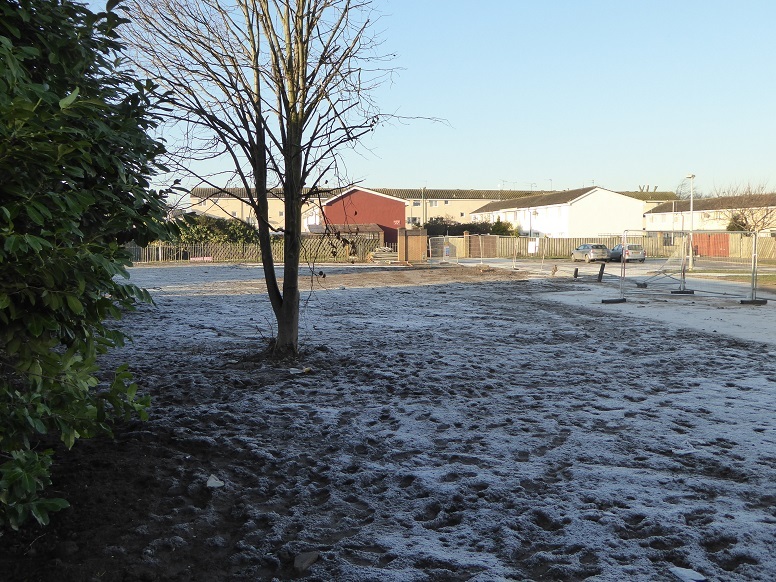 Slower and less dramatic, the choice of method was influenced by proximity to domestic properties and, lying adjacent to Laxthorpe, the grounds of Thorpepark Primary School. 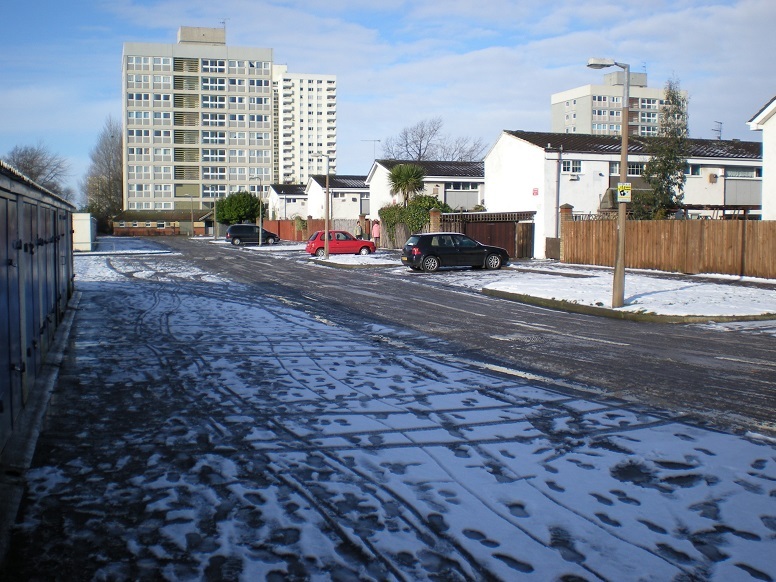 This view westwards, taken 13th February 2009, shows the Laxthorpe low-rise unit visually presiding over the cul-de-sac. Behind it stands Bridgeman House. To the right is the Kinthorpe midi block. All are occupied at the time. 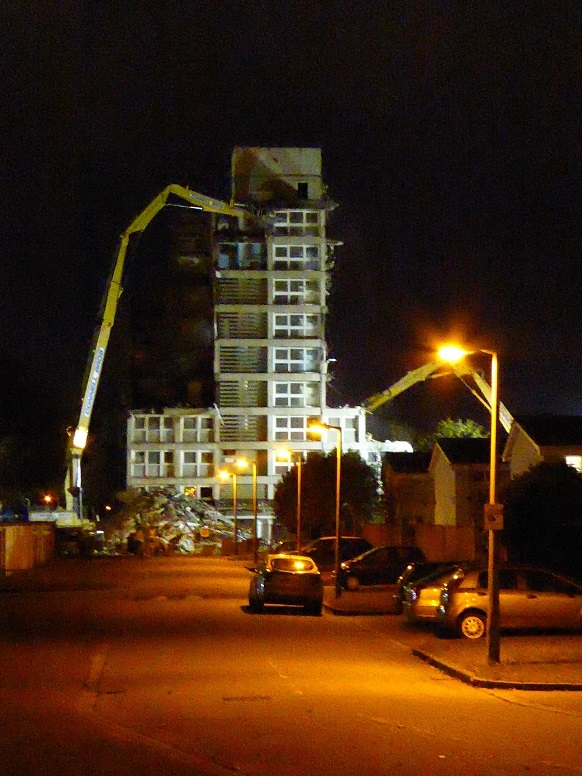 Demolition under floodlight. The extent of nibbler action is apparent [18:39 29/10/2014]. Close-up of the nibbler tool. Tight manoeuvre. A nibbler, stripped of long-reach boom, on a low loader reversing from Laxthorpe into Thorpepark Road [11/11/14]. 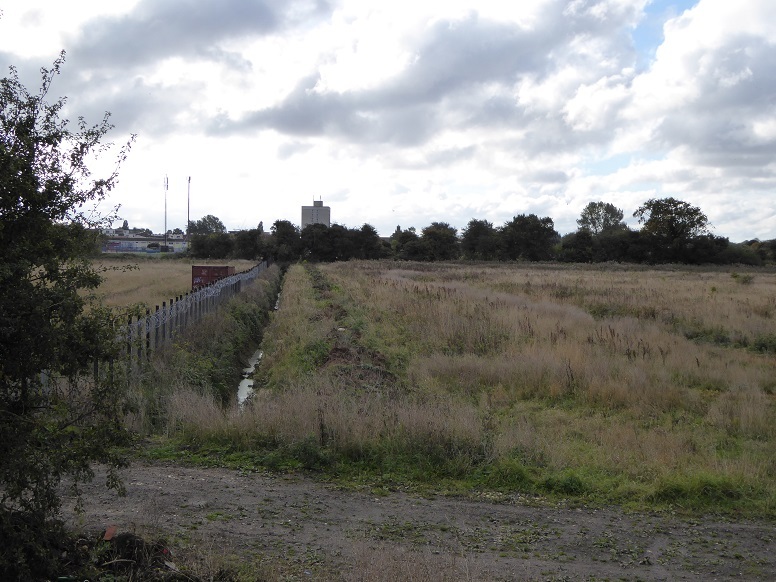 In this picture of the cleared site, an emerging regenerated heart to Orchard Park may be observed. A housing development rises beyond the site of the Homethorpe tower blocks. At extreme left, a hint of framework marks a replacement shopping centre under construction. 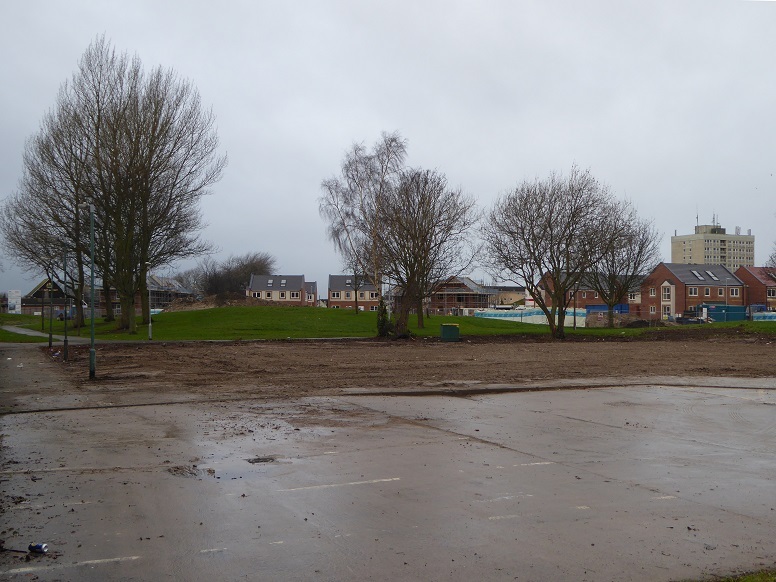 Land in the middle ground will be used for an extra care facility scheduled to open 2017. Over to the right, Gorthorpe low-rise block remains (for a while) sole representative of the Thorpes multi-storey experience [18/12/14]. And so to the end of an era. 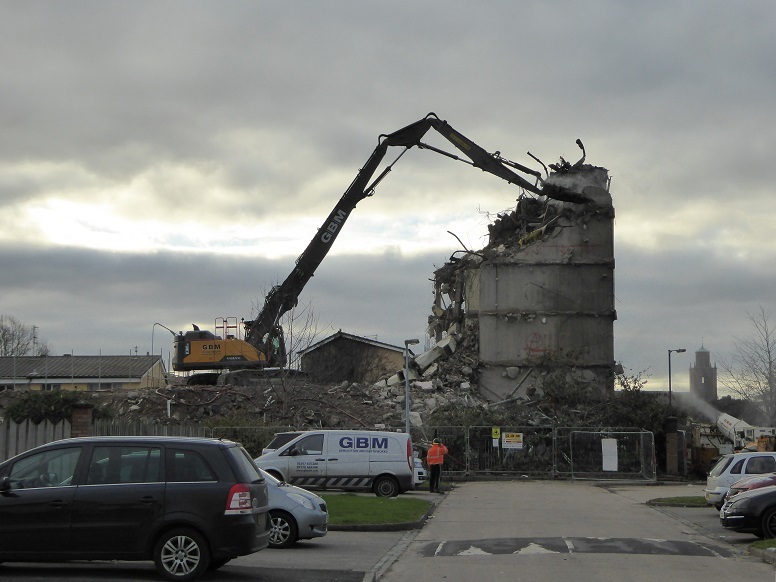 Demolition of the Gorthorpe low-rise block was, as with Vernon House, delayed because of roof-mounted antennae. Multi-storey flats when left empty for some time are prone to acts of vandalism. On 11th May 2015 a room was set alight on the sixth floor. Viewed from the rebuilt shopping centre, with an example of new housing at the opposite side of Hall Road, the Gorthorpe unit serves as a lingering reminder of an earlier philosophy. A blackened window frame, resulting from the fire, is evident [17/10/2016]. 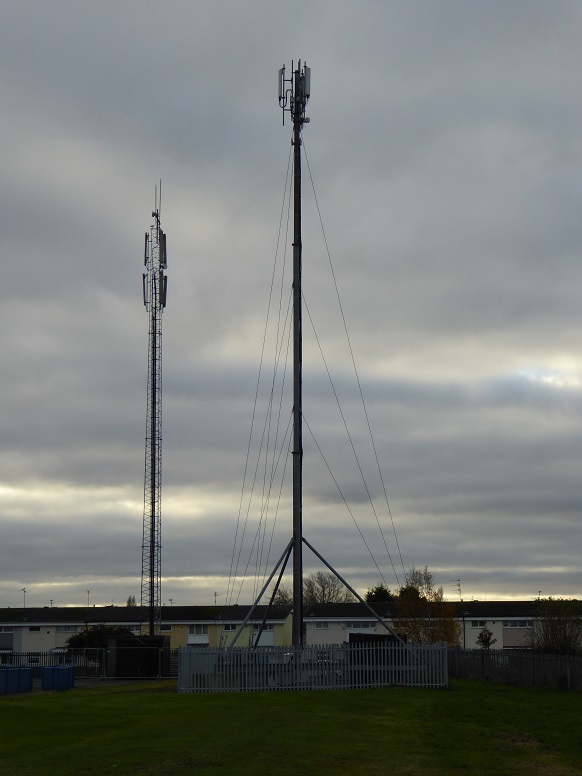 Temporary antennae provide a mobile phone signal for parts of north Hull and Cottingham [24/11/16]. The Gorthorpe low-rise and temporary antennae as seen from the side of the A1079 (Beverley bypass section). For many years the skyline at this approach into the city was dominated by Orchard Park’s eight towers and two other midis [20/10/16]. A nibbler works away from a platform of rubble. At lower right picture, beneath the distant tower of St Michael’s and All Saints, a wet blower reduces dust [24/11/16]. As 2016 draws to a close, the site is cleared. A tree marks the site of a small communal garden that bordered the eastern side of the block. The short wall across the frosty earth stood at the entrance to the building [29/12/2016]. Hull’s Orchard Park Estate comprises four urban villages known as the Courts, Danes, Shaws, and Thorpes. No multi-storey buildings were constructed in the Shaws. Photographs and text by Brian Williams.